Earlier this month at Twin Cities Veg Fest Dave Rolsky, Matt Mackall, and I were awarded the Kenny Feldman Animal Advocate Award. We are co-founders of Compassionate Action for Animals, the organization that hosts the festival. Kenny was a good friend of mine and was the inspiration for my involvement in social justice. He cared deeply about animals. We lost him in 1999 to suicide. Please read more about him. His parents have kept his memory alive for awareness about mental health and animal advocacy. 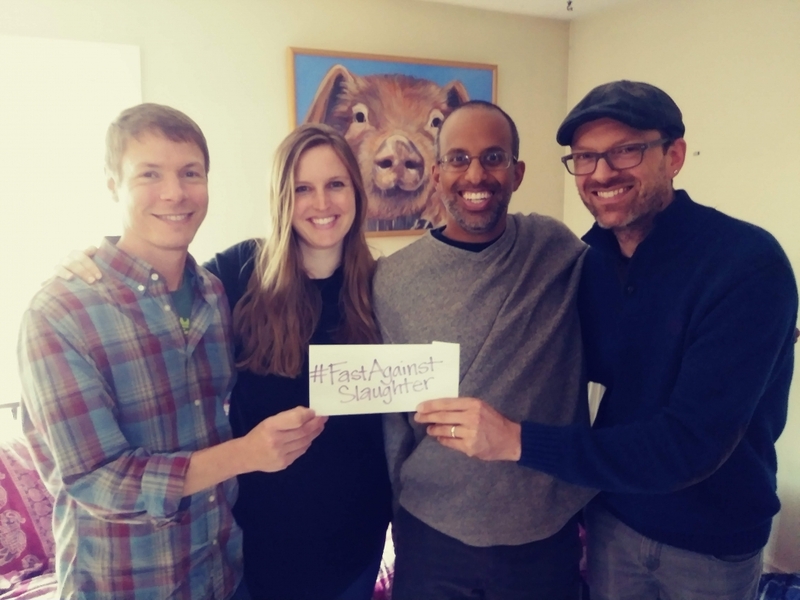 It was three guys who received the award, but there were many more co-founders, movement leaders, and activists who were involved in the early years that helped Compassionate Action for Animals become a powerful organization. Many of these folks were women and femmes. Two were present at the festival, Amber Schmidt and Sharyn Morrow. All of us were involved in an organization that preceded Compassionate Action for Animals, and Amber was a leader. She put a lot of energy into animal advocacy and was consistently kind to fellow activists. Sharyn was involved in the early days of Compassionate Action for Animals, when we had few volunteers. It’s important to recognize the efforts of women, who have always done most of the work in animal advocacy organizations I have been involved in, but rarely get credit. On a different note, on Tuesday, October 2, I will fast all day (I will drink only water and eat nothing) for World Farm Animals day. October 2 is Mohandas Gandhi’s birthday. 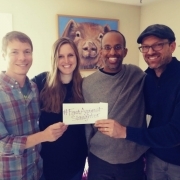 I fast as an act of sacrifice in honor of farm animals that are suffering and being killed. I use fasting as a way to develop discipline, an important component of being a powerful activist. Please join me! But I have mixed feelings about the fast: sometimes people see both activism and dietary lifestyle choices as a form of deprivation and noble misery. I don’t feel that my choices to speak out have led to having less. Indeed, many of my most significant experiences are connected to being an activist: it has been an opportunity to grow spiritually and feel grounded and whole, I have found people to share comradarie and love, and I have found ways to be generous that feel great! I hope that my fast can be seen in this context. I meant to blog this month about the connection of healing/wellness and animal advocacy, but that will have to come in October.